Raised Print Business Cards is rated 2.0 out of 5 by 1. Rated 2 out of 5 by Thomad from Business Cards The order process was very cumbersome and "clunky". I had to call 3 times to work through how to upload a file to indicate the Raised UV breakout. The initial proof was wrong and had to be rejected and then I was not contacted and there was no follow up. The online file templates for this product are wrong. I have buying print for over 20 years and have never had this many issues. End the shame of handing out the usual flat and drab business cards. Make sure everyone takes notice with raised spot UV business card printing. Clear and glossy spot UV accents shine brilliantly to present your design and message well. You can use this to promote your new business or prospects. Or maybe you want to impress and be unforgettable. No matter the size of your business, raised ink business card printing pushes your brand from passable to premium. A clear high gloss polymer to coat selected areas of the print. This super glossy finish is raised to 50 microns high to give a tactile and embossed feel. The result is an increase on your business card thickness from 16 pt. to 19 pt. for a sturdier build. Note: Raised spot UV business card printing is available in the popular 2" x 3.5" size. Feels like the real thing. The raised coating adds a realistic texture to your card. You can add a raised spot UV over a water droplet design to make your business card feel three-dimensional. This is perfect for food, beverages, jewelry, nail products, or even car detailing. Highlights important text or design elements. 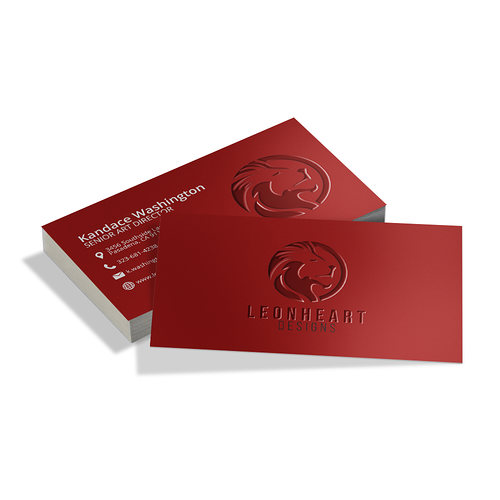 Emphasize your logo, company name, or important message in your business card printing. This glossy finish puts a spotlight on text fields that are 10 pt. font size or larger. Creates an interesting background. Since raised spot UV is a clear coat, you can put a pattern on your business card design without it competing with the important aspects of your artwork. This also adds a unique texture that will make people want to touch it. Note: To prevent your business cards from sticking to each other, keep your raised spot UV coverage to less than 30%. Learn how you can put your raised spot UV business cards to work with these helpful marketing tips. Download our business card templates or use our online design tool so you can get started on your design. What do you mean by printing turnaround time? “Printing turnaround time” is the number of days we need to product your order. This starts from the time you upload your artwork to a paid order, and does not include weekends, holidays, and transit time. Can I put raised spot UV accents on both sides of the business card? Yes, you can definitely do that. Just make sure you choose that option on the online calculator. Also, don’t forget to keep your spot UV accent coverage to 30% or less. Your raised spot UV business cards will be shipped to you already cut to size and neatly boxed. Click on the size below to download a zip file that contains templates for the raised spot uv business card size you prefer. Includes horizontal and vertical orientation.